Add a hint of red to your outfit with this sophisticated necklace by Aarikka. 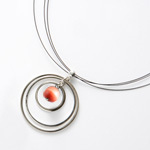 With three metal rings and a red bead at the centre, the necklace has a subtle yet striking design. Wear the red necklace to work or when you are out and about during the day, or team it up with similar jewellery for formal occasions or parties. This necklace is very versatile. Made from eco-friendly materials, the red Jazz necklace is easy-to-wear, lightweight and guilt-free. Go on - treat yourself this spring.